VGL1039/1: Made of Cast Iron. Hold upto 13mm dia, T type screw, powder coated. Square section diecast aluminium bosshead fitted with 2 brass chrome-plated thumb screws. The block has 2 slots right-angled to each other for accepting rods upto 16 mm diameter. All stands have perfectly machined and stable bases and machined\ perfectly vertical uprights with standard 9mm diameter. Boss Heads (x-blocks) are directly machined out of solid Brass rods. We have a exclusive range of Boss Heads offering to our clients. These are manufactured using quality material. 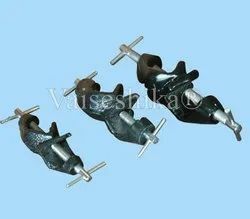 The Boss Head Clamp offered by us are usually black coated and could be used both vertically and horizontally. These Boss heads are light weight to provide easy handling. 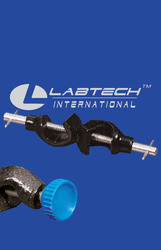 Our products are available in various composites to our valued clients. Made of AL-alloy die casting with mild steel screw holds upto 16mm dia, powder coated finish. We are offering an extensive range of superb quality Boss Head to our clients. A light alloy pressure die casting with offset jaws, which ensure great strength. The V-grooves in the body are accurate and give a firm grip on rods up to 16mm diameter. The clamping Screw is of nickel plated brass. We are instrumental in trading a wide gamut of Boss Head for our clients. BOSS HEAD IS MADE OF ZINC PRESSURE DAI CASTING. Clamps holdersare designed so that it can hold a rods 5/8" in diameter or smallerin right angle. Clamps holders are available in different finishes like nickle plated, zinc plated or black powder coated. It can be customarized by request. Made of Pressure Die Cast Zinc Alloy. Powder coated body with double mild steel screw keys with plastic coated tops. Accepts objects upto 18mm dia rod. - Square section die cast aluminium Bosshead. - Fitted with 2 brass chrome-plated thumb screws. - The block has 2 slots right-angled to each other for accepting rods upto 16 mm diameter.